What cameras have been used with the Elev-8? The GoPro HD is a popular choice. I use the Contour HD. GoPro HD is expensive and wireless is a $99 option. So, I need a wiress camera under $200. I use FlyCamOne eco v2. Video quality is OK, and $40 price tag is nice...I uploaded a sample video here. It is designed for use with R/C vehicles and is powered from a standard servo connection. Pretty easy to hook up. You can control the camera (record on/off) using an extra channel on your R/C receiver...though I haven't fiddled with it enough to make that work yet. I'm still experimenting with mounting the video head for best vibration isolation, as my current scheme picks up some aliasing (waviness) in the video under certain conditions. EDIT: re-reading your post...looks like you are after a wireless system so you can do first person view flying? If that's the case, my suggestion above isn't what you're after, it's just a simple video cam. Are you looking to do FPV flying with a wireless camera, or are you looking to record your flights? I would like do FPV flying now and possibly flight recording later. 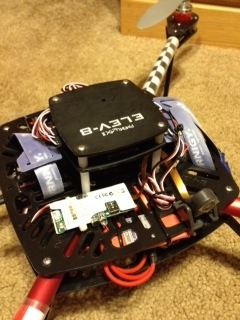 I have attached a few links below for the FPV system that I use. This is just a video system for you to fly from, and you would need a separate camera to do flight recording from. 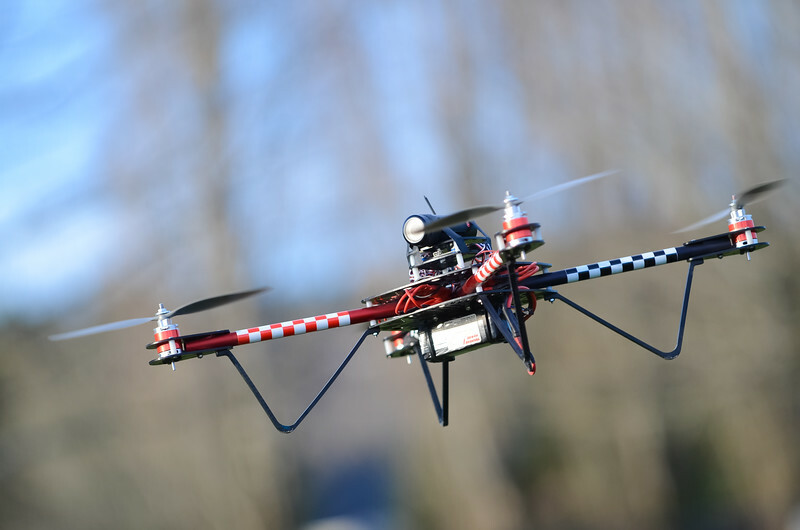 You could also hit two birds with one stone and use a GoPro or the new Intova camera that we will be making available here soon that have auxiliary video out jacks, and you can record your flight while using that video feed to transmit back to your base station to fly from. There are many possibilities and different combinations of components. Anyways, here is the setup that I have that works well! I didn't attach a video display because we just use displays that we have here laying around, we didn't go out and buy an expensive set of goggles or anything like that. We found that a 7" monitor works best, because any bigger and you feel like you are looking around alot, and any smaller and you cant see anything! I got a ham radio license 20 years ago (KB0MSR), used it a bunch until cell phones were the norm. Now I am excited to use it again for ATV (amateur video). My FPV setup is running in the 1.3 ghz band (1280MHz specifically). This band does require the amateur radio license and use of it requires call-sign identification at least every 10 minutes. For the ELEV-8 I will be using this setup from ReadyMadeRC.com : TX, Camera, RX, generic Philips 7" LCD monitor. I bought some FPV equipment from RMRC last year for the StingRay. Works well and due to some compatibility issues I needed support and in the end a slightly different combination of TX/RX. The vendor took items back and provided me with different items, no extra shipping. For the StringRay I will be using this setup from ReadyMadeRC.com : TX, Camera, RX, generic Philips 7" LCD monitor. Given the StringRay is ground based with lots of battery and not much of a weight concern I went for the largest TX so that I could use it in doors. Works well through a surprisingly large amount barriers. 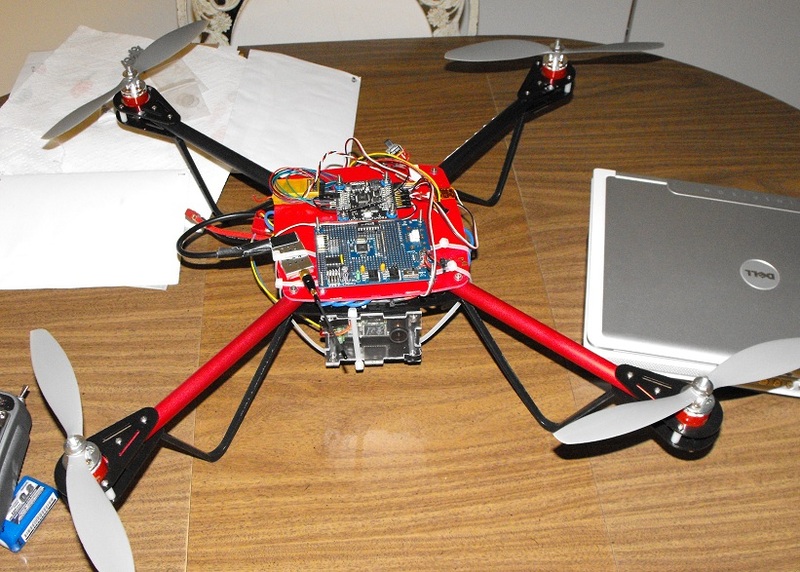 As expected the high TX output does interfere with some unshielded sensors and cheap servos. I've been waiting for an affordable method to transmit HD video. I don't know if this is it yet but maybe it could be modified to include a high gain antenna on the receiver. 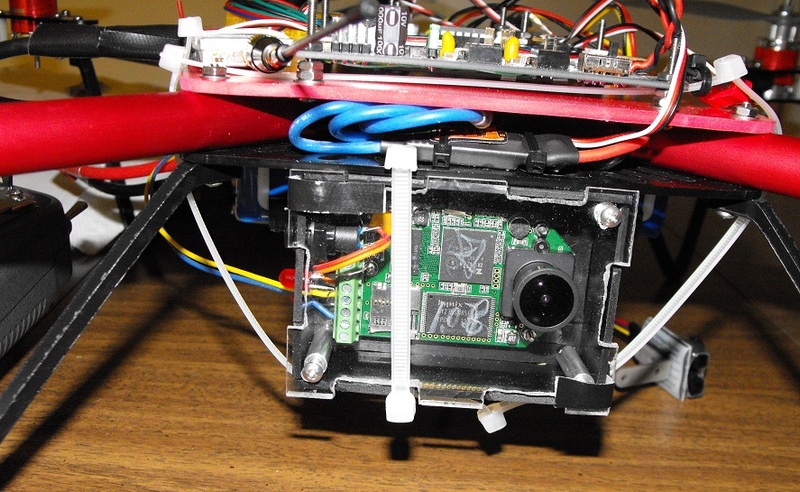 SparkFun is selling a new camera, HackHD. One nice thing about the camera is it doesn't require any changes to get a uC to start and stop it. You can also use the "LED" pin to monitor which mode the camera is in. I really like the fact, it has a video out pin, so I can transmit the image and watch what's being recorded in real time. I should have one tomorrow to play with. I also thought this camera looked interesting so I added it to my last HobbyKing order. I've got two of those little HD Wing cameras. They take surprisingly good video for the price, but you have to use a very good SD card. I have a Class 10 in mine and it's fairly good. Edit: This is an example of the video - bear in mind this is my first attempt at video and one of the earliest flights with my ELEV-8. Yes, I broke a prop. I "tested" eltitude hold right at the end and was still having a "slight stability problem". The HD Wing camera was velcroed on the top of the ELEV-8 facing forward providing a nice look at the half roll before it was thrown into the grass. Mounting is tricky with this little camera, but velcro seems to work pretty well. I wasn't able to watch your video the first few times I tried (I don't know if my PC was causing the problem or if YouTube was having trouble). Very cool to see the river. A lot more interesting than my neighborhood. I tested out the HackHD. I don't have software to edit HD video yet (I'm open to suggestions) so there's some extra footage at the beginning and the end of the flight. The flight starts at 1:40 (skip ahead unless you like watching grass grow). Remember to select "1080" resolution if you want to wait for the full HD version to load. I have the original file in my dropbox here (over half a Gig in size). It looks better than the YouTube version. If you download the dropbox version, be aware the flight doesn't start until 1:40 (I presently do not have a way of editing HD video (YouTube has its own editor so I was able to trim the YouTube version down to just the flight footage)). I didn't realize until after I'd made an enclosure for the camera that it came too close to the field of view of the camera. You can see in the video how the left edge of the shot is blocked by the camera enclosure. After making my makeshift enclosure, I used cable ties to secure it to the Elev-8. Here are a few picture of my modified Elev-8 with the camera attached. I was pleasantly surprised how little the picture shook. I was anxious to get some aerial shots with the camera so I attached it anyway I could think of. I plan to spend some time to make a better mount that can pan and tilt. I'll likely get a GoPro at some point, but for now, I'm pleased with how well this camera is working. Edit(9/11/12): I've removed the original 0.5Gig file from by DropBox folder. If anyone wants a copy just let me know and I'll make it available again. Sony is releasing their Action Cam this month. It will have active stabilization, wifi, one touch record, a waterproof enclosure and the ability to shoot 120 fps in 720p (it shoots 1080p in regular frame rates) - and weighs only 2 ounces. Anybody seen the new Parallax Camera Mount? I haven't. Where is it? I might have to look into that HackHD, it looks like it's way easier to mount, etc. and you get output for OSD, I think. You've got lots of guts to fly right on your street like that - I'm really glad I've got open space to fly in since I'm finding my R/C skills aren't what they used to be. Flying over the river is also pretty risky because I could lose it and have to go fish it out. I was going to try some more video this weekend, but my boat go in the way. Next weekend they are moving a 6.5 million lb bridge span about a half mile down the Mississippi from where it was built on land to the new bridge site. My marina is right next to the action - within about 1000' of each end of the move and the barges will be very close to my boat when they go by. So we've got a bunch of guests coming to watch the action and I had to get ready for that. I wish I was more proficient with the ELEV-8 so I could get aerial shots of it but, on second thought, with the Coast Guard out there with 50 cal machine guns on their boats and all kinds of security around, they probably wouldn't take kindly to a UAV showing up all of a sudden. We can't even take our dinghies out - $40,000 fine and the possibility of getting a couple of rounds across the bow. They are totally shutting the Mississippi river down for about 4 days. Do you have a R/C flight simulator? Training by flying one of the simulated helicopters will really help you learn to fly sooner. Apparently there are simulators with quadcopters now. I have RealFlight v3.5. I can fly a simulated helicopter upside down with the nose pointed in any direction (usually without crashing) but when I fly my TRex600 or my ELEV-8, I'm too chicken to do anything fancy (not even nose in flying). I have some LED strips on the back end of the ELEV-8 to help me keep track of which direction it's pointed. I found with my small $100 Turnigy quadcopter that a crash is soon to occur if I lose track of which way it's pointed. On my small quadcopter, I added some RGB LEDs. I usually have the LEDs on the left side (port) set to red while the starboard LEDs shine green. I plan to add some RGB LEDs to the ELEV-8 sometime soon but for now a strip of red LEDs across the back really helps me to know which direction the quadcopter is pointed. I'm using RGB LEDs so I can have them display fun patterns if I want them to. While in general I think the ELEV-8 is easier to fly than a helicopter of the same size, I think it's easier to keep track of a helicopter's orientation than a quadcopters. @MattG, How soon until the camera mount is ready. Is it a pan and tilt rig? Anymore details? I'm just getting started building one myself. It's going to be very annoying to have just finished mine to find I could have purchased a better one from you guys. The GoPro was a Ipod / in the sense it tool off to market and spurred a few others . Mine is a Low Def one . And when I replace it Ill look at other Brands as the 2 Button interface is VERY annoying . Yes, I have a simulator that does quads and uses my Spektrum dX-8 transmitter. I just don't have time to play with stuff these days. I got kind of discouraged with the ELEV-8 because I still can't get the altitude hold to work - it flips over as you saw in the video. Got to work on that. Back in the late 70's early 80's I was really into R/C airplanes - even aerobatic competition (before the really heavy 3D stuff), but I seem to have lost a lot of that proficiency. I had a R/C gas heli a few years back and got to the point where I could fly it around the yard (standing behind it) and hover pretty well. Like you, I just didn't have the guts to try nose in or anything more complicated so I sold it (at a profit, believe it or not). At the time quads were just getting started - little electric ones that I thought were really cool, but they cost about $1100 bucks and didn't really do much. That's why I jumped on the ELEV-8 because it's reasonably priced and pretty easy to fly. I just have to get out and work with it. I also need to fly the sim and my little Blade MQX. Like I say, time is my big problem. I'll have a lot more time once fall and winter get here. I got kind of discouraged with the ELEV-8 because I still can't get the altitude hold to work - it flips over as you saw in the video. I've only tried altitude hold once myself. My ELEV-8 also flipped over busting two props. I want to find some way of restraining the ELEV-8 before I try using altitude hold again. I've wondered about flying the $100 Turnigy quadcopter with the HoverFly Sport board so I could just hold the whole quadcopter with one hand as I tried using altitude hold with it. 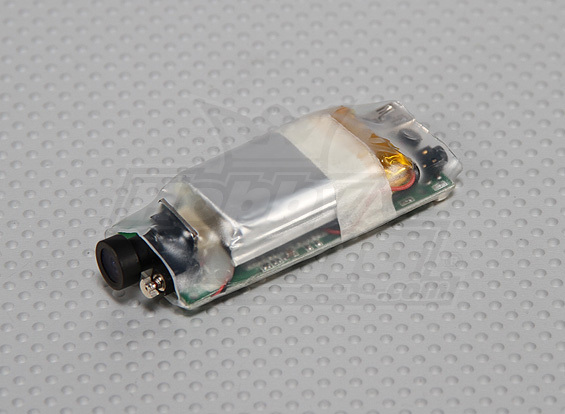 I don't think it would work with the small quadcopter since I've already tried using a different ultrasound module (one of the $4 eBay deals) with the small craft but the motors seem to interfere with the sensor. The ultrasound stopped working (always returning the maximum distance) as soon as I start the motors up. I have the Hoverfly Pro board (and the GPS board) and the altitude hold should be no big deal - I believe it uses barometric pressure. I must have a problem with the board because I have all the gains set as they are supposed to be. I would really like to have the altitude hold working so I can "relearn" nose in, etc. with minimal distractions (like controlling the height). One of these days, I'll get the latest software update for the pro board and re-do all of the settings and start over. I need to hook it up to a computer and monitor the values with their software and, hopefully, I can have enough length on the USB cable to move it up and down enough to see if it's working. My ultimate goal is to have it fly about 1/8 mile over to my brother's house and return autonomously. Then I will invest in FPV and really start having fun. Rich just posted a really cool GoPro video in the ELEV-8 build thread. I'm really tempted to get a GoPro but I'd prefer a camera with similar capabilities that also had an optical zoom. Any suggestions? The GoPro sort of has a zoom in that you can select different fields of view, while maintaining HD resolution. I think that zoom is over rated. The only time I use zoom is when the camera is mounted to a solid tripod. Otherwise the video is just too unsteady. So many times I have watched video that I or someone else has taken and have regretted the use of zoom.